At the invitation of the Lausanne Orthodox Initiative, Archpriest Eric G Tosi, Secretary of the Orthodox Church in America, offered a presentation at the organization’s gathering at the Saint Vlash Monastery here on Tuesday, September 16, 2014. 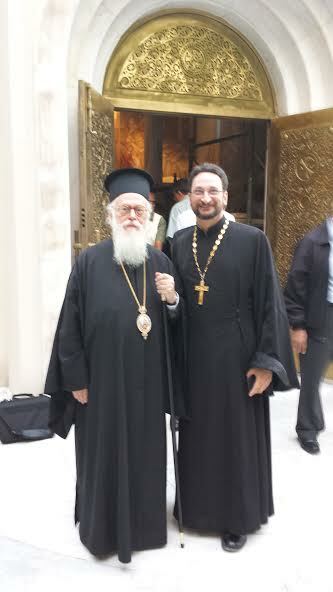 The gathering, which concludes on September 19, is being hosted by His Beatitude, Archbishop Anastasios, Primate of the Albanian Orthodox Church. Representatives of Orthodox and Evangelical churches from around the world are in attendance. Father Eric, a Doctor of Ministry candidate at the University of Toronto, Trinity College and the Toronto School of Theology, spoke on “Koinonic Evangelism: The Parish as the Evangelist” as part of a panel on spiritual transformation through mission. His presentation was based on his doctoral dissertation on evangelism in the community.